The City of Trail is situated on the banks of beautiful and mighty Columbia River. 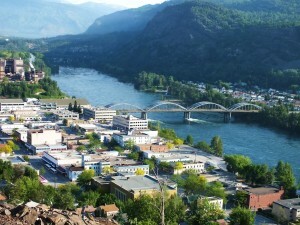 Trail is commercial, financial, and industrial centre for the South Kootenay region. This city had its beginning during the mining boom around the end of last century. 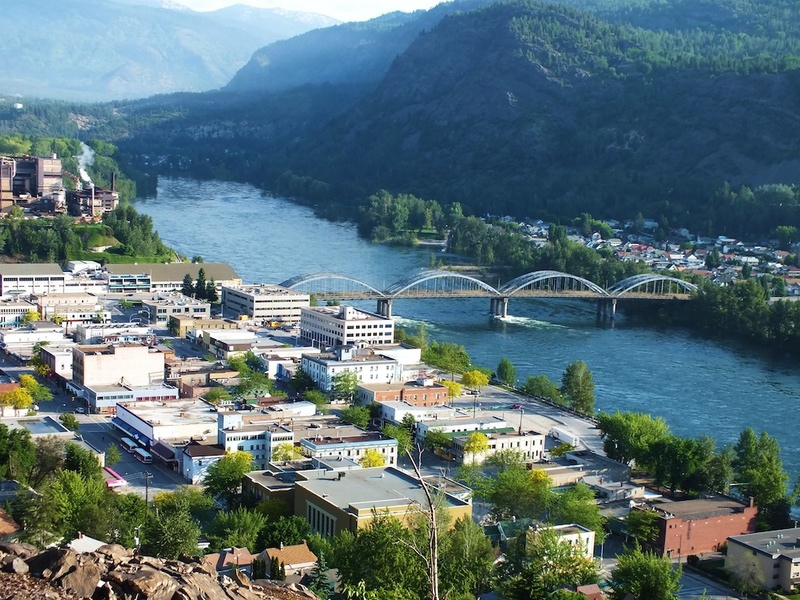 In 1896 Trail, British Columbia was the home of the first smelter, which, in a much changed and more sophisticated format, still dominates the skyline and the local economy. Trail is also known for its significant Italian community. Before the end of World War II Italian immigrants were largely responsible for shaping the community’s social and cultural structure. After World War I, the Trail Smelter operations expanded significantly with the break-through treatment of zinc-laden ores. Through the 1920s, the Trail Operations expanded into full production of lead and zinc, as well as gold, silver, cadmium, and bismuth. The CM&S also expanded into the production of fertilizers using by-products of the zinc smelting process. With the enormous growth of the Trail Smelter, Trail’s population tripled by 1941 to 10,000 and the City had expanded into the East Trail residential area. By 1951, the population had grown to 12,000 and the City had expanded into the Sunningdale and Glenmerry residential areas. Today the terraced homes, rock walls and bright gardens tucked into the winding streets of “Little Italy” delight visitors from all over the world. Trail is a major industrial and financial centre in the Interior of British Columbia, dominated by Teck Cominco’s smelter, one of the world’s largest integrated lead-zinc manufacturing complexes. Trail has produced many fine national athletes and champions. Trails sports and recreational facilities are second to none and the excellent dining and cultural facilities add to the friendly and clean atmosphere of this wonderful city. View of the City and Cominco Smelter 1961 Cominco Ltd.’s Trail Operations continues to be the economic cornerstone of the Greater Trail area. Recent modernization of the Trail Operations has promised to extend Cominco Ltd.’s presence in Trail well into the 21st Century. The City of Trail continues to prosper in this strong, economic climate and to provide its citizens with first-rate services and quality of life. Trail BC consists of a number of sub-divisions – East Trail, West Trail Columbia Heights, Miral Heights, Glenmerry, Rivervale, Tadanac, Sunningdale, Waneta Mall area, and Waneta Columbia Gardens area. By 1941 the City had expanded into the East Trail residential area as the population grew as Cominco prospered during World War II. On Rossland Avenue you will find the neighbourhood known as “the Gulch.” Originally called “Dublin Gulch”, it lost the “Dublin” as it filled up with Italians who came to Trail to work at Cominco. Many of them chose not to live on the original Trail townsite and built their homes on the banks of the mountainside. The Gulch consists of four or five hundred metres of houses and apartment blocks, and the best Italian grocery store in Trail – the Star Grocery – and other shops, Rossland Avenue rolls down the length of the Gulch on its way to Trail’s city centre with Saint Anthony of Padua, on the left at the top of the Gulch. On the right, there are a number of well known establishments and clubs – The Rex Hotel, Columbo Lodge Italio Canadese Hall, Trail Hotel and the new Casa Lingo Italiana Restaurant (now in the old Nellie’s Pizza building). At the bottom of the Gulch, Rossland Avenue is the Best Western Terra Nova just down from highway 22 which leads left up the 8% grade along the side of Smelter Hill on its way to Castlegar 26 kilometres away. By heading down eastward you reach Victoria Avenue, defining the northern bounds of Trail’s central business district. The sub-division of Sunningdale is reached via Charles Lake Drive from East Trail. In the late 1940’s after World War II, houses were built and financed by Central Mortgage and Housing Corporation to provide affordable housing for returning war veterans. Sunningdale consists of a lower bench and an upper bench. The upper bench mainly consists of houses that were built for war verterans, while many houses along Hazlewood Drive with river view lots were built and owned by doctors and professionals.